The Pontiff’s predominant appeal is spiritual, not political. His commitment to the poor and our shared world is obvious. Most people yearn for meaning in their lives which no government can provide. More than his recent predecessors, he speaks into the lives of common people. 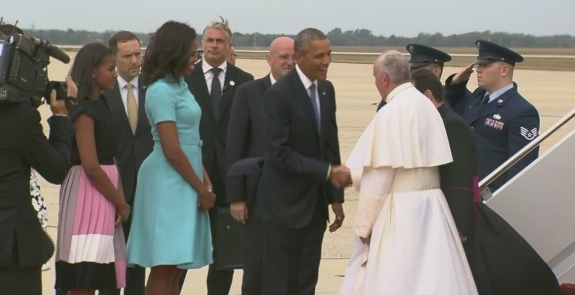 However, the papal visit has generated controversy because Pope Francis appears to be a man of the Left. Of course, religious imperatives may have political implications. For instance, Christian Scripture and church tradition require concern for the poor and environment. But there is no specific “Christian” answer to the many social ills. Consider environmental issues. Stewardship is an important Christian responsibility. However, the relationship between humans and the world around them always has been complex. The pontiff assumes the worst regarding the environment. Yet much of the environmental news actually is quite good. For instance, air and water generally are cleaner than they were even a few years ago. The slowdown in population growth essentially destroyed any case for coercive population controls. Important environmental problems remain, of course. However, capitalism helps answer even the toughest questions. For instance, greater economic development and innovation provide the means to solve often complex problems. Markets also promote efficient trade-offs, highlighting the benefits and costs of alternative policies. Yet in Laudato Si the Pontiff appeared to suggest the common good yields only one correct environmental standard. However, facts are not a matter of faith. The consensus that the climate is warming does not extend to how much and how fast temperatures are likely to rise, as well as how great the likely social impact and how best to cope with those effects. Even when the objective is clear, such as addressing climate change, there typically are multiple means of achieving a particular end. If, for instance, one believes temperatures are rising and the consequences will be serious, there still are many possible solutions. One is mitigation, a highly costly attempt to lower temperature by cutting energy use. Another is counteracting the impact indirectly, such as planting trees and promoting technological transformations. A third strategy is adaptation, a much less expensive policy of adjusting to specific problems. What is best is a matter of man’s wisdom rather than God’s commandment. When markets do not operate and property rights do not exist, some government action is necessary to ensure environmental protection. Nevertheless, policymakers must recognize the inherent infirmities of politics. There is no guarantee that increasing the power of parliaments, bureaucracies, and courts will solve environmental or other social problems. Yet the Pope in Laudato Si largely ignored the government’s own woeful environmental record. Politics inevitably reflects government’s and humanity’s imitations. Not everyone who claims to represent the common good does so; politicians and environmentalists are no more virtuous than businessmen and conservatives. Perhaps the most important trade-off ignored by the Pope is the importance of the free economy in providing wealth and opportunity—which improves the chance of living a fulfilling life—for the poor and disadvantaged. The best jobs are most likely to proliferate in competitive and innovative economies. Thus, while the pontiff’s moral judgments deserve respect, his economic opinions warrant less consideration. His formative economic experience came in Argentina, a statist kleptocracy which enshrined injustice. The principal lesson from Argentina and similar systems should be the importance of rejecting stifling political restrictions on the economy. Economic liberty, that is, freedom to work, invest, trade, and create is an outgrowth of the wondrous creativity with which God has infused mankind. Even so, America’s economic system must not be exempt from moral judgment. The Holy Father helpfully reminds us that God calls us to far more than economic growth. In Laudato Si the Pope observed that “the emptier a person’s heart is, the more he or she needs things to buy, own and consume.” Neither politicians nor businessmen can fill that void. Pope Francis deserves a warm welcome in the U.S. He is an important moral and spiritual leader who speaks to people’s deepest human needs. However, Americans should respond more skeptically when the pontiff moves from spiritual to political matters. His status as the Vicar of Christ gives him no special qualification as a political pundit. Doug Bandow is a Senior Fellow at the Cato Institute and former Special Assistant to President Ronald Reagan. He is a member of the Advisory Board of the Acton Institute and author of Beyond Good Intentions: A Biblical View of Politics.